Beautifully engraved certificate from the Bristol-Myers Company issued in 1968. This historic document was printed by the American Banknote Company and has an ornate border around it with a vignette of two allegorical men with the company's logo between them. This item has the printed signatures of the Company’s Chairman of the Board, and Vice President and Treasurer, and is over 47 years old. In 1887 William McLaren Bristol and John Ripley Myers decided to sink $5,000 into a failing drug manufacturing firm called the Clinton Pharmaceutical Company, located in Clinton, New York. The company was officially incorporated on December 13, 1887, with William Bristol as president and John Myers as vice president. The partners worked hard to expand the business, but it was at first an uphill struggle. From the start, however, they had two rules: insist on high quality and maintain the firm's good financial credit standing at all costs. In May 1898 came a new name: Bristol, Myers Company (a hyphen replaced the original comma after Myers's death in 1899 when the company became a corporation). Not until 1900 did Bristol-Myers announce a breakthrough into the black, where it has remained ever since. The company's first nationally recognized product was the one that chief chemist J. Leroy Webber termed a poor man's spa: a laxative mineral salt that, when dissolved in water, reproduced the taste and effects of the natural mineral waters of Bohemia. Christened Sal Hepatica, the new product sold modestly for eight years. Then, from 1903 to 1905, sales suddenly mushroomed tenfold. Two years earlier, this runaway success had been joined by another: Ipana toothpaste, the first dentifrice to include a disinfectant in its formula and thus the first to protect against the effects of bleeding gums. The demand for Sal Hepatica and Ipana turned Bristol-Myers from a regional into a national company and then an international one. The postwar depression prompted Bristol-Myers to jettison its ethical drug business and "devote itself entirely to its specialties": its two big winners and a dozen or so assorted toiletries, antiseptics and cough syrups. Company headquarters was established in Manhattan, where it has remained ever since. And having shifted squarely into the consumer products arena, Bristol-Myers began advertising its products directly to the public. In 1924, gross profits topped $1 million for the first time in Bristol-Myers history. The company's products were on sale in 26 countries. 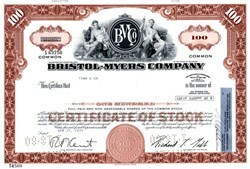 At this point, the shares held by John Myers's heirs became available for sale, triggering a series of moves that turned Bristol-Myers into a publicly held company, listed on the New York Stock Exchange in 1929. With the acquisition in 1943 of Cheplin Laboratories (a Syracuse, New York manufacturer of acidophilus milk), Bristol-Myers again became a producer of ethical drugs. Cheplin, which had expertise in fermentation techniques, became a key supplier to the U.S. War Production Board's crash program to mass-produce penicillin for the Allied armed forces. By the end of the war, it was clear that penicillin and other antibiotics represented an immense opportunity for the company. Cheplin was renamed Bristol Laboratories, and Frederic N. Schwartz was put in charge of it. In 1957 Schwartz was appointed president and chief executive officer of Bristol-Myers when Henry Bristol, approaching 70, chose to shed some of his former responsibilities and become chairman of the board. Reviewing the company's situation and prospects, Schwartz and then treasurer Gavin K. MacBain (later Schwartz's successor as CEO) decided that Bristol-Myers should embark on a program of acquiring well-managed smaller companies. The two executives' first major move in that direction was to acquire Clairol, a company founded by the husband-and-wife team of Lawrence M. Gelb and Joan Clair, which had turned haircoloring from a difficult-to-use commodity associated with flashy women into a highly successful mainstream consumer product. With Clairol also came the executive who in 1972 was to succeed MacBain as CEO of Bristol-Myers Company: Richard L. Gelb, elder son of Clairol's founders. In 1976 Richard Gelb was elected chairman of the board. Within a dozen or so years after Clairol joined the company, a number of other acquisitions followed, including those of Drackett, Mead Johnson, Zimmer and Westwood. In 1986 the company opened a state-of-the-art research complex in Wallingford, Connecticut, designed to house more than 800 scientists and support staff. In 1995 the facility would be renamed the Richard L. Gelb Center for Pharmaceutical Research and Development. In January 1994 Charles A. Heimbold, Jr., was elected chief executive officer. In 1995 Heimbold also became chairman. The historical information was obtained from the company's website.